I honestly have to say that the project seems to go really well. I enjoy every day of my internship because every week there is something new to develop. Every time I am excited what comes next and which idea’s will be altered and which will be completely new. As every week I will give you a little impression of what has happened recently. 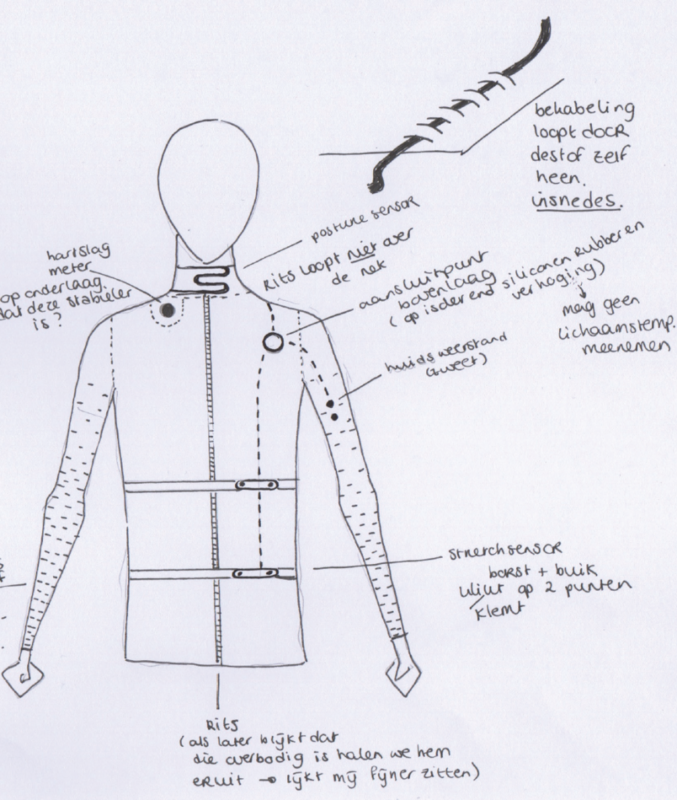 The design of the Silence Suit is in development. Vera de Pont works hard to optimize the sketches and to start sewing as soon as possible. This week she came along to show some different cloths. She also presented her newest sketches of the suit. The idea of a contemporary monk is taking shape. The air circulation is also optimized by including the pattern in the design. 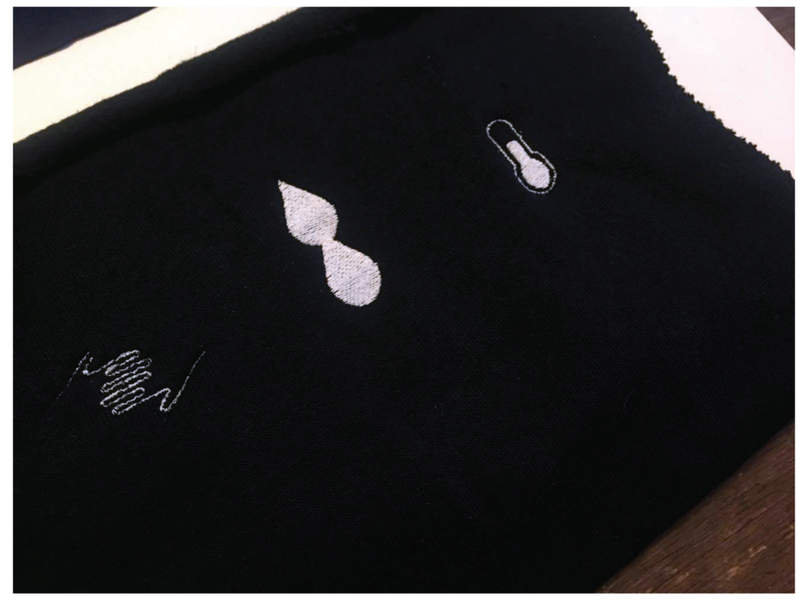 To decorate the suit in a practical way, she plans to embroider graphic icons on the pockets of the different sensors. So, you know all the sensors and it simplifies the maintenance of the suit after washing it. We have to work on the artificial intelligence part of the system. At a certain point the system has to know what a good meditation session is to influence it in a positive way. The goal is to program a good meditation session. The programmer wants to know constitutes meditation quality? To answer that question a lot of tests have to be done. By means of a questionnaire in combination with the data of the session Danielle wants to do research about the quality of the meditation. Therefore, she plans to include a new sensor in the suit and we already did some tests with it this week. The plan is to lengthen one sleeve of the under vest to a glove. 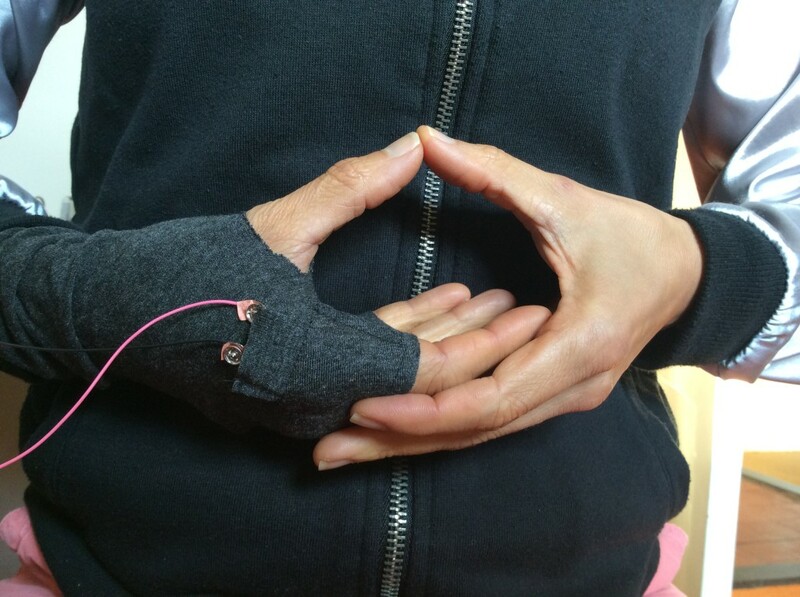 We have to include two buttons in the glove that you can push while meditating without moving that much. One button will mark an extraordinary positive experience in the timeline of the session. You have to push the other one if there is a negative influence of your surroundings. For example, if the light instrument falls down or there is some background noise you can push the button. The system will mark that point in your timeline and you can see afterwards the effect of that occurrence on your meditation. The form as well as the content of the Silence Suit are in development. As you can see every week we are making steps to get a grip on the complexity of the project.